I will never make it as a fashion blogger, or really any kind of consumer blogger, because I could never provide that steady stream of stuff that, I take it, isn't even meant all to be acquired, but just desired. I don't even want the mental clutter. Because I need that space to think about whether or not there's an appreciable difference between mental and physical clutter. If all physical objects exist as mental forms, then physical clutter simultaneously exists in the mind? It's the mental aspect of physical clutter that concerns me. Roughly I think that your possessions should not exceed the capacity of your mind to catalog them, you should be able to comprehend what you own. And it's so incredibly much easier to pare down your possessions than to expand your mind. So I weeded out some more of my sweaters, and these are the thirteen sweaters that I'm wearing with the four miniskirts that I wear to work. 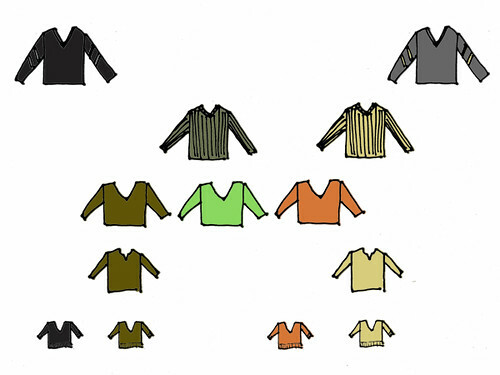 Thirteen seems like a ton of sweaters to me, and I don't think I have a lot of sweaters. I wonder how many sweaters people who have a lot of sweaters have.